They have appeared on BBC & Sky1 TV, featured on Star for a Night, been recommended in the Sun newspaper and on the front cover of a Sunday Times Magazine. Abba's Angels have even been interviewed on Sky News in front of half a million viewers regarding the rumours of an Abba Reunion! 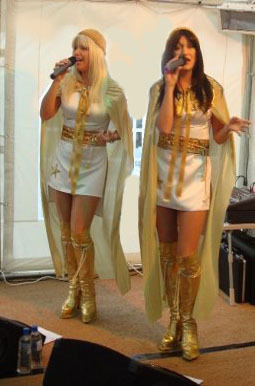 Abba Tribute Shows are typically either 1hour or 2 x 45 minute sets with several stunning costume changes and the band comes self contained with a high quality sound system and dazzling stage lighting.The band can also play music before, in between and after the show to save you hiring a separate DJ. 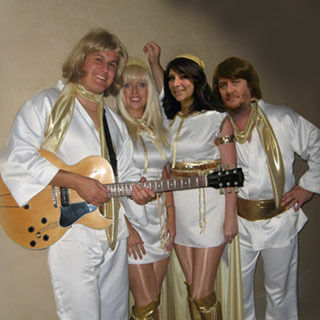 Abba's Angels perform all the best known Abba songs wearing painstakingly hand-made replica costumes with choreographed dance routines. 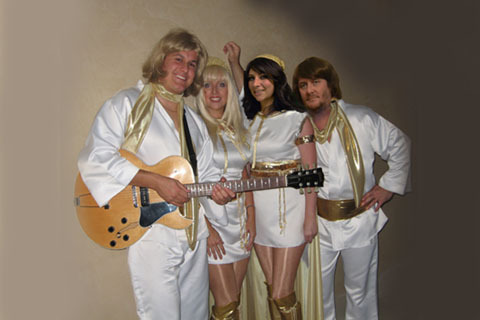 Available predominantly as an Abba Tribute Band ( 4 piece with live keyboards and guitar or 5 piece ( add drummer) but also as a 2 girl Abba Duo ( 2 girls with backing tracks).